All LAYTON LAKES homes currently listed for sale in Gilbert as of 04/22/2019 are shown below. You can change the search criteria at any time by pressing the 'Change Search' button below. "NEW FLOORING W/WOOD-LOOK TILE JUST INSTALLED! Turn-key home in high demand Layton Lakes! Spacious single level, move-in ready w/generous room sizes t/o. Cozy front courtyard welcomes you to this well-maintained home, split floor plan w/massive formal living/dining area overlooking the gorgeous pool. Double doors lead to office/den. Open, light-filled family room just off kitchen w/informal dining. 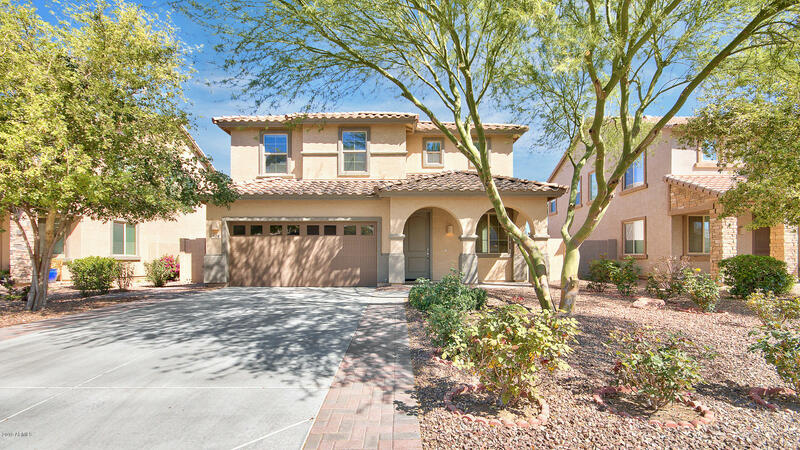 Kitchen features beautiful granite counters, spiced maple cabinetry, stainless appliances includin"
"UNBELIEVABLE OPPORTUNITY IN GILBERT'S DESIRABLE LAYTON LAKES COMMUNITY! Extremely Popular ''Columbus'' Floor Plan Featuring 5 Bedrooms, 3 Full Bathrooms, Expansive Great Room, Open Kitchen Design and Large Upstairs Loft Area. This Layton Lakes Residence Offers Functional Living Space for the Entire Family and Includes a Downstairs Bedroom and Full Bath. Oversized Private Backyard Space includes a Grassy Area with Extended Paver Patio, Bench Seating, and Mature Trees...Perfect for Your Arizona O"